Not only has B Floral traveled the city of New York far and wide to immerse and inspire guests of varying events, but our team has been fortunate enough to join clients at venues across the country! 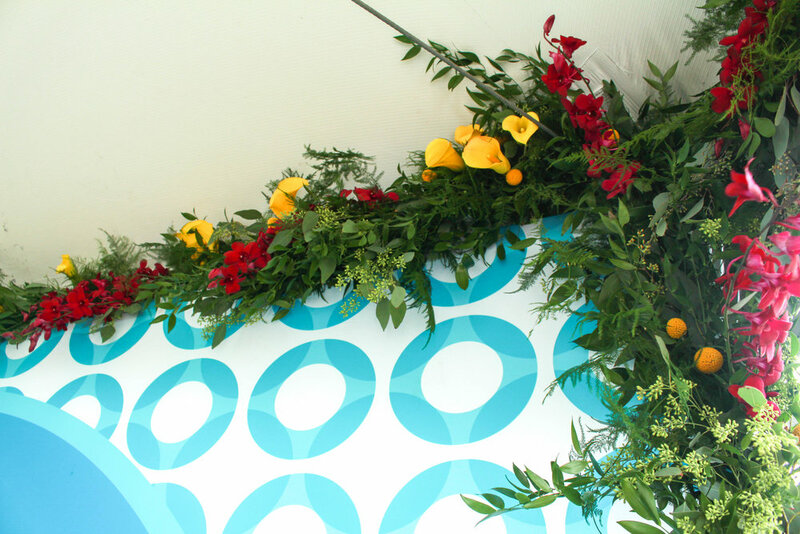 From coast to coast, we have provided floral walls, centerpiece arrangements and so much more for all different kinds of events and activations. Read on to find out about just a few of the exciting events that B Floral has traveled outside NYC for! Working in San Diego was a whole new adventure for us! The natural elements and southern border vibe of San Diego gave us plenty of inspiration for a LaCroix Sparkling Water booth at the Latin Food Fest! Using the festival and San Diego as our influences, we created an immersive booth where guests could embrace the experience from start to finish. The focus of the décor was a variety of tropical leaves, pineapples and painted succulents to pull from LaCroix’s logo and packaging colors. To create a photo moment that would WOW guests, we made a backdrop of the colorful Pineapple Strawberry LaCroix boxes. Atop those boxes were various succulents painted teal to pop against the backdrop and pineapples. Behind the booth was a back bar, featuring the product and the elements used to make that product. To break up the space of the booth, we also added two statement pieces with large cacti and succulents planted at the base. They created other points of focus that guests could feature on social media. When Southern hospitality and sweet Georgia peaches call your name, you just can’t resist! The Cashmere Agency and Netflix asked us if we could travel to Atlanta for multiple events, and we were ready to go right away! The events were all centered around Netflix’s release of the comedy/drama, “Nappily Ever After.” They were hosting influencer parties and receptions that we were meant to celebrate the film. We created walls that showcased Netflix and the new show itself. The walls were filled with colorful flowers that contained numerous tropical elements. We also made matching table arrangements and centerpieces that would coordinate with the colors of the wall. They wanted BOLD, and that’s what we gave them. Hopefully we see you soon again Hotlanta! Even though it’s not as far as others, Boston is just as exciting of a city for us to travel to! We have worked with LaCroix Sparkling Water at many events, but this one for the Head of the Charles Regatta, a rowing competition, was like no other. We were completely inspired by the rowing teams and took the event to the max. 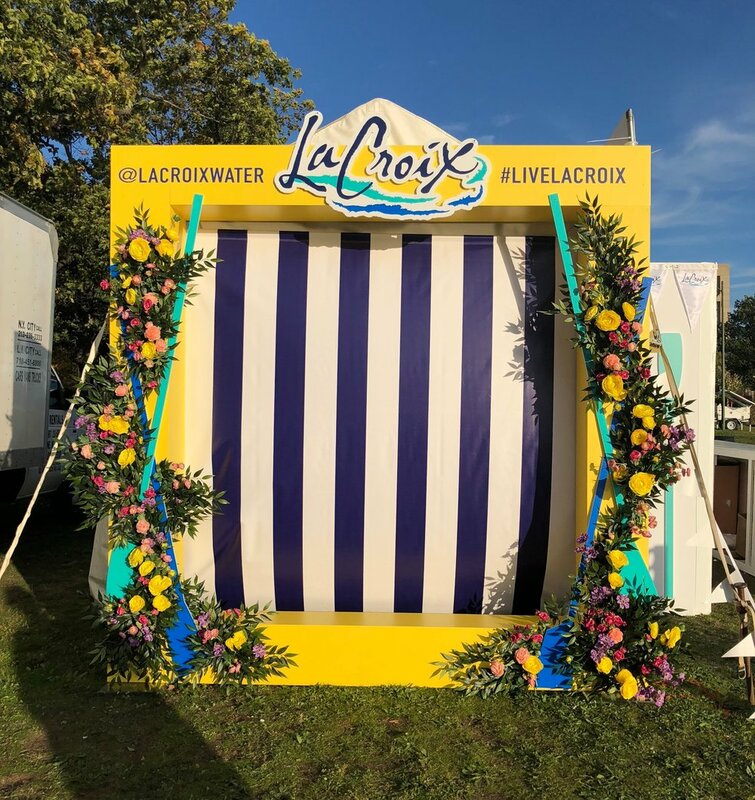 LaCroix knew they wanted one of their signature bars to hand out product from, so we brought a fully branded bar with a backdrop that featured branded pennant flags and oars, fully combining the LaCroix Sparkling Water brand and the event itself. Additionally, we created a photo moment that guests could enter and be immersed in. Florals and greenery, along with LaCroix cans and oars completed the floral moment. To top it all off, we brought along two branded corn hole sets featuring four different flavors! Even the beanbags used in the game were branded! Ah the Windy City - what great adventures! LaCroix Sparkling Water featured the flavors of lemon, apricot, orange and grapefruit at the USA Today Food & Wine Experience. Overall, we wanted to create a clean, bright fall look using lots of yellows, oranges, and pops of pink. For this bar area, we used a similar bar to previous LaCroix events. The back wall held alternating product and baskets filled with the fruit elements found within the products. We put social media hashtags and handles on the wall to incorporate the guest experience as much as possible. We then draped the wall with a floral garland filled with greenery and fruit elements, AND we included cut outs of actual LaCroix cans to emphasize the brand as much as possible. We didn’t stop there - guests had so much fun with our life size cut out of an actual LaCroix can - 8 feet tall! The grapefruit photo moment was unforgettable. B Floral is no stranger to La La Land! Los Angeles is one of our favorite cities to travel to. One event we specifically traveled to Los Angeles for was the Ovarian Cancer Research Alliance’s Super Saturday charity event. We brought them short, compact arrangements with lots of greenery and bright florals. We even included a few succulents in the arrangements for a unique style. Another piece of this event’s design was the logo wall. It was decorated with hanging floral garlands with red, pink and purple flowers. We tied in the style of the arrangements with the wall by incorporating hanging terrariums that had succulents in them, as well. It was all well worth the trip to sunny LA! Although it’s nearby, entering the Hamptons transports you to an entirely different atmosphere, and we’re always up for this refreshing change of scenery! 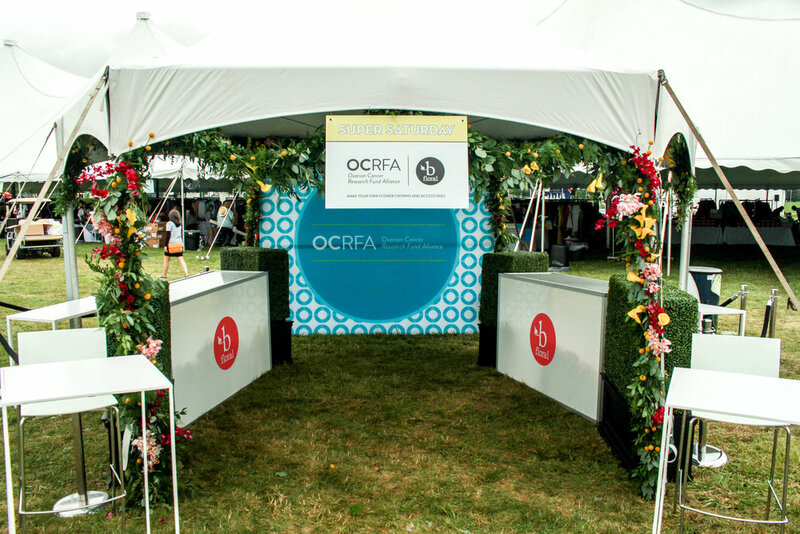 We created an installation to be used at another Super Saturday event for the Ovarian Cancer Research Alliance. This one was a floral accessory takeover! We gave guests the chance to make their own flower crown or floral accessory and rock them for the entirety of the event. Most guests even snapped a pic wearing their crowns in front of our branded step-and-repeat, which was framed with a charming and delightful floral garland. Whether it’s 90 minutes from NYC or halfway across the country, B Floral has definitely made its mark in more cities than just the Big Apple. Trekking across the country with floral walls, branded bars, and delicate arrangements is no easy feat, but we don’t let that slow us down! We transform spaces and venues all over the country. It’s just as exciting for us to explore a new city as it is for a brand to let us completely transport their guests to a whole new world. We look forward to see where we go next! Looking to Make Your Event Instagrammable? Here's How.